The biggest street-legal drag race of the year comes to Route 66 Raceway with nearly a dozen heads-up classes, Index categories, street car madness for Chevy, Dodge, and True Street enthusiasts, Car Show, and Manufacturer's Midway. It is Chicagoland's biggest vintage and modern muscle car event of the year with NMRA and NMCA coming together for four days of fun. The weekend culminates with the famous Nitto Tire Super Bowl of Street Legal Drag Racing. The 14th Annual Nitto Tire NMRA/NMCA Super Bowl of Street-Legal Drag Racing is the crown jewel of events in the ProMedia sanctioning body. 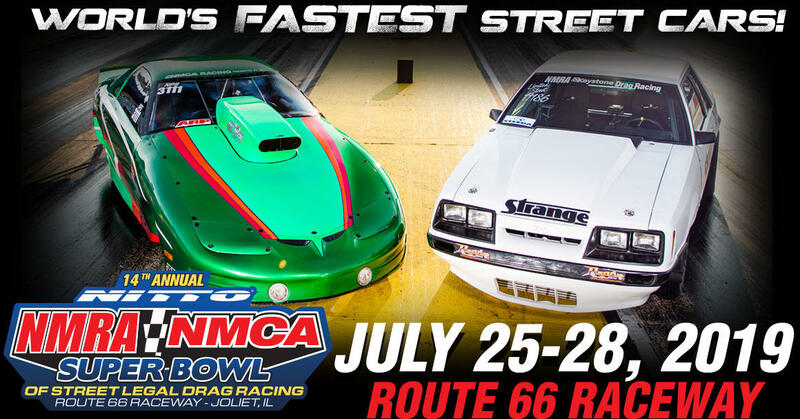 Race officials combine all classes across both NMRA and NMCA organizations, creating the biggest Championship Street Racing event of the year, held July 25-28, 2019 at Route 66 Raceway. Once each organization has determined a class winner for its championship categories, the two groups are then pitted against each other for the Nitto Tire Super Bowl of Street Legal Drag Racing. Super Bowl runoff winners get a cash bonus while the winning team walks away with a collection of Nitto Tire Diamond Tree rings. Off-track action is just as exciting with a combined Car Show that attracts some of the coolest custom vehicles and restored muscle cars that the Chicago-area has to offer. The show spans two days, Saturday and Sunday, with both NMRA and NMCA competitions and well over 100 awards presented to participants. Nearly 100 vendors and manufacturers crowd Manufacturers Midway on Friday through Sunday, offering show specials and a chance to talk one-on-one with representatives. True Street uses an open format to attract everything from showroom stock cars and rookie racers to quick street cars and veteran drivers. The Saturday-competition features a 30-mile road tour followed by back-to-back-to-back runs on the Route 66 Raceway quarter-mile. Officials rank the contestants based on their average ET and give away eight class winner awards and prize money from Overall Winner to a 15-second zone winner. It is the best entry-level category offered in drag racing. NMCA and NMRA officials even give True Street racers a chance to enter Sundays bracket racingfree of charge! The biggest Aerospace Components Winners Circle celebration of the year happens at Route 66 Raceway by crowning event champions in NMRA and NMCA as well as a Nitto Tire Diamond Tree ring presentation for the winners of the team challenge.